The credit for this winning recipe goes to Sue Bellmore who shared this via the St. Mary’s CWL cookbook. We sold this as a cake at the bakery and it elicited a wedding proposal from one octogenarian! Amazingly this translates into a gluten-free version that is every bit as fantastic. Cupcakes, a photo by Anne’s Favourites on Flickr. 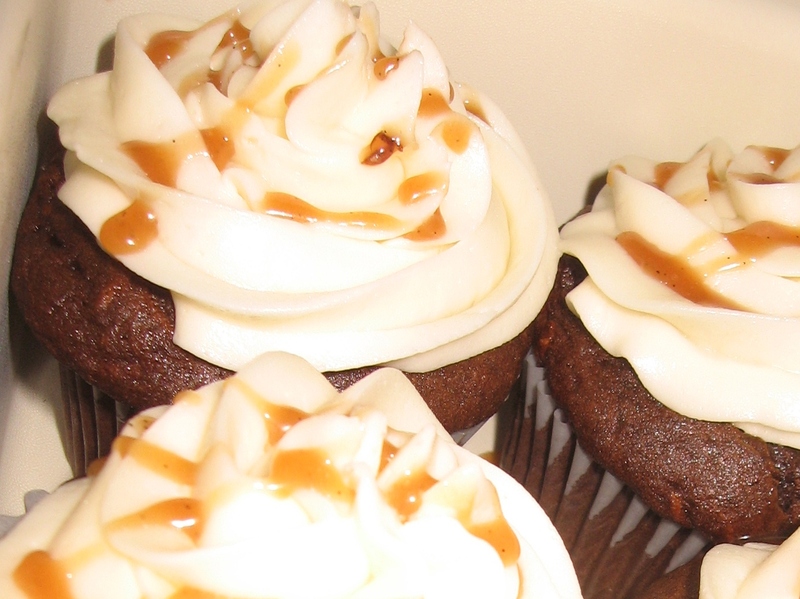 I read on someone’s blog they drizzled caramel on top of their chocolate cupcakes with butter icing and I just happened to have some of the Vanilla Bean Salted Caramel Sauce from Barefeet in the Kitchen so I tried that http://barefeetinthekitchen.blogspot.ca/2013/05/vanilla-bean-salted-caramel-sauce-recipe.html. It was a match made in heaven! Use the Wilton 1M tip to make frosting cupcakes a breeze! Beat oil, margarine, sugar, eggs and vanilla until light. Sift flour, baking powder, baking soda, xanthan gum and cocoa into egg mixture and beat until combined. Scrape sides and stir in zucchini and chocolate chips then beat for 2 minutes. Fill paper line muffin cups using a quarter cup or a 2 1/4 ounce scoop filled just to level. 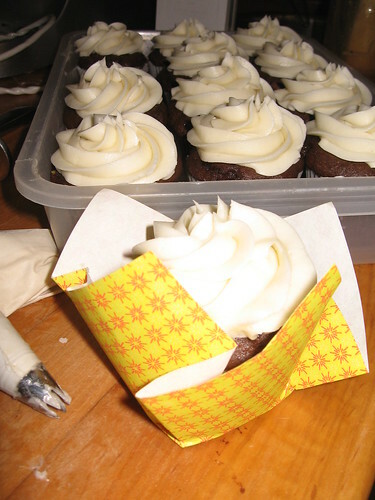 If you overfill the cupcake tops will be large and difficult to frost and transport. Bake at 350°F for about 30 minutes, until cupcake springs back when lightly touched, and internal temperature has reached 220°F .